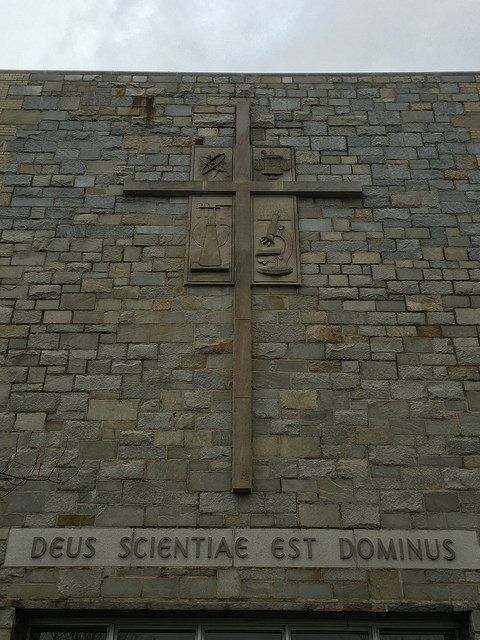 This inscription, Deus Scientiae est Dominus, translates to “God is the Lord of knowledge”. Artists Ferrenz and Taylor created the inscription that is located at St. John’s University’s Queens campus. It is inscribed outside of St. Albert Hall, which was built in 1956. St. Albert Hall houses the science department. St. John’s University made no mistake in carefully choosing the name of the hall where the science department is housed or the inscription on the building. Each was chosen carefully to depict a powerful, unified message. As a university, the mission of St. John’s, in respect to truth, is to maintain an atmosphere where a quest for truth is one of the foundations of a crucial teaching-learning process and the progress of lifelong learning. As a Vincentian university, the mission of St. John’s, in respect to truth, is to devote our intellectual resources to recognize injustices and encourage solutions (Our Mission). Knowledge and truth are very well connected. The inscription is taken from 1 Samuel 2:3. The second chapter of Samuel is also known as Hannah’s song. Hannah proclaims God to be the Lord of knowledge after Hannah, who was barren, visits the shrine, where she asked for a son and promised to dedicate him to the service of the Lord. The Lord remembers her and she has a son (Cook 1999, 12). There are such things as unknowable truths. A truth may be unknown to some and known to others thus making it in certain regards an unknowable truth. God, as the Lord of knowledge, is the master of both known and unknown truths. God grasps the full capacity of knowledge being truth (Edgington 2010, 41-42). St. Albert the Great was a scientist like no other. Science, for him, was a way to understand God through His creation. Despite constant criticism and accusation from fellow Christians, he remained strong in his support of science as a gateway to knowledge. St. Albert sought after the Truth. Science was one of his methods to discover truths, move man closer to God and unveil knowledge. St. Albert contributed his ideas and opinions on Aristotelian method and natural science. It is his contributions to science and his Vincentian outlook on the importance of service that brought about the name “St. Albert’s Hall”. The inscription on St. Albert’s Hall perfectly describes how St. Albert felt about God, science, knowledge and truth (Vost 2011, 293-296);Weisheipl 1980). Cook, Joan. Hannah’s Desire, God’s Design: Early Interpretations of the Story of Hannah. England:Sheffield Academic Press, 1999, 12. Edgington, Dorothy. “Possible Knowledge of Unknown Truth.” An International Journal for Epistemology, Methodology and Philosophy of Science 173 (2010): 41-42. doi: 10.1007/s11229-009-9675-9. “Our Mission | St. John’s University.” St. John’s University. 2016. Accessed March 18. http://www.stjohns.edu/about/our-mission. Vost, Kevin. St. Albert the Great: Champion of Faith and Reason. North Carolina: TAN Books , 2011, 293-296. Weisheipl, James. Albertus Magnus and the sciences: Commemorative essays 1980. Canada: Pontifical Institute of Mediae, 1980, Kindle edition. This entry was posted in St. John's University, Mission Office, Queens Campus and tagged Academic Service-Learning, Lord of Knowledge, Office of University Mission Collection, Science, St. Albert Hall, St. John's University. Bookmark the permalink.